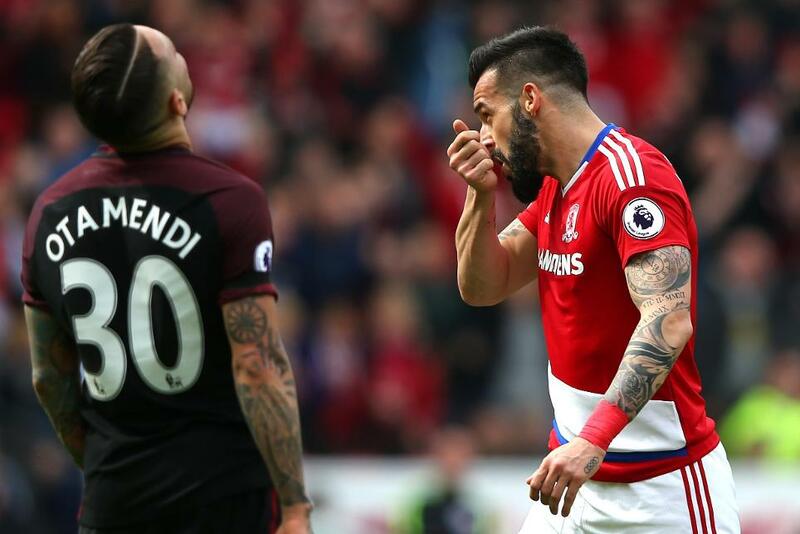 A source of huge frustration in Double Gameweek 34, Middlesbrough’s Alvaro Negredo (£6.2m) earns a spot in the latest Dream Team line-up after bouncing back with a 12-point haul against former side Manchester City. Elsewhere, Chelsea’s Pedro (£6.8m) and Swansea City playmaker Gylfi Sigurdsson (£7.4m) both ended recent dry spells to receive call-ups and revive their Fantasy Premier League fortunes. The Hull City goalkeeper earns a third Dream Team call-up thanks to a late penalty stop at Southampton, his second spot-kick save of the season. Benched by 81% of his 994,000+ owners at the weekend, Jakupovic next faces relegated Sunderland at the KCOM Stadium on the back of successive clean sheets. Overtaking team-mate Marcos Alonso (£6.8m) as the top-scoring FPL defender, Cahill is now level with West Bromwich Albion’s Gareth McAuley (£5.2m) on six goals from defence. 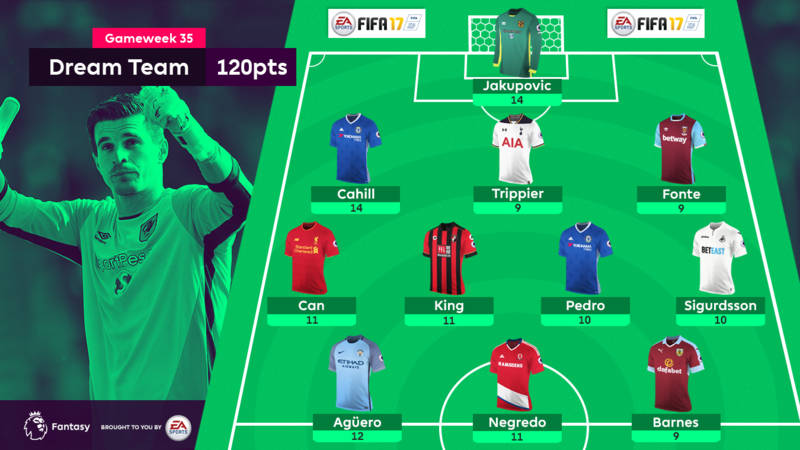 A goal, clean sheet and maximum bonus points in a 3-0 win at Everton earned a 14-point haul, joint-top with Jakupovic for the Gameweek. Making his third start over the last six Gameweeks, the right-back claimed maximum bonus points in the 2-0 derby triumph over Arsenal to gain a third Dream Team selection. Trippier has produced either defensive or attacking points in all four of his Gameweek starts. A Dream Team debutant, the centre-back secured maximum bonus points and helped the Hammers to a third clean sheet in four Gameweeks, courtesy of a 0-0 stalemate at Stoke City. A spectacular overhead kick at Watford, along with maximum bonus points, earned the midfielder a second Dream Team outing. Owned by only 2.2% of FPL managers, Can has netted five times this term, having scored once in each of his previous two campaigns. A 15th goal of the season consigned Sunderland to relegation and again underlined the Norwegian’s FPL value. Ranked top for outfield players for points-per-million (26.5), King was awarded a third appearance among the select XI and remains a key asset over the run-in. A sublime long-range goal steered the Blues to victory at Goodison Park, with a pair of bonus points and a clean sheet point enough to cement a fifth Dream Team call-up. Ending a run of eight matches without a goal, Pedro’s FPL ownership is back on the rise following a five-Gameweek decline. Another player to end a dry spell, the Swans midfielder fired his first goal in 11 Gameweek starts with a spectacular free-kick at Old Trafford. An 11-point haul earns Sigurdsson a fourth call-up to the Dream Team and suggests that he can provide further returns over his remaining three matches. Aguero gains recognition for a fifth time of the season thanks to a first double-figure haul since Gameweek 13 in the 2-2 draw with Middlesbrough. Forced off with a groin injury late on, more than 22,000 managers have already parted company with the Argentinian, who is losing owners to team-mate Gabriel Jesus (£8.7m). Returning only four points from his two fixtures in Gameweek 34, the Middlesbrough striker was the most-sold player ahead of Gameweek 35. But Negredo punished his doubters with a first double-digit return since Gameweek 17 in Sunday’s draw with Man City. Having returned a sixth goal of the season and three bonus points in the 2-0 win at Crystal Palace, Barnes remains a viable budget forward option. Burnley’s remaining three fixtures all score two in the Fixture Difficulty Rankings (FDR).